\ We were recently sent a download version of The Scavengers - eGuide by Progeny Press. Now, if you have been a reader for a while, you know we really like GOOD Literature guides, and more importantly we like a company that offers guides for a wide variety of books. This, dear friends, is Progeny Press! They offer a wide selection of guides for a wide range of grade levels. The Interactive eGuides they offer are FANTASTIC! I'll be competely and 100% honest for a second here. When we received our first one, I didn't know what to expect, and I just printed it off and that was that. I had no idea you can work right in the PDF download! Multiple choice question? No problem, you can answer that. Short answer or essay? Easy as can be...just type right there on the page. This guide is 100% interactive, and there's no need to use a ton of paper and ink/toner! SCORE! 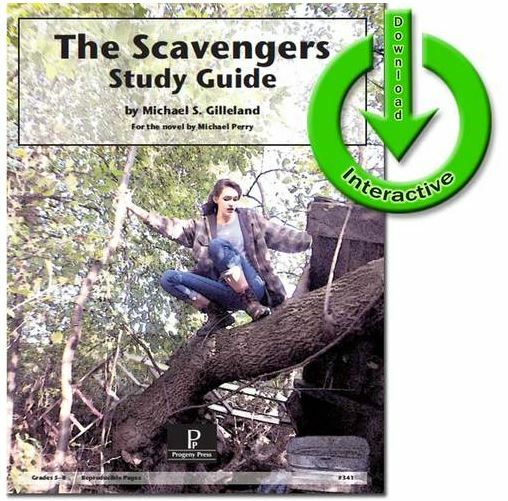 For this review, we received The Scavengers - eGuide as a download. Like I said above, the first time I used one of these guides (and you can do a search on the blog for Progeny Press to read the reviews I've done for them...) I knew it said interactive, but I was a little confused by it all, and ultimately I just printed the whole thing. While you CAN do that, why would you?! It's so much more fun to answer on the computer! Actually, this was a suggestion by one of Mr. B's educational experts. She suggested having him type out the answers to questions (rather than via diction) so that he would be forced to learn proper spelling, grammar, and punctuation so that he could strengthen his writing skills. All of those skills are very important. He can think of what to answer, but he loses it when he goes to actually handwrite the answers. These interactive guides are PERFECT for this! He can type his answers right there in the PDF, and then I can go in and print it off. I would like to have him answer in BOLD FACE PRINT so that his answers stand out, but I haven't figured out if that's possible to do yet. After he answers, I just print off a few select pages for his portfolio. It's THAT easy folks! There's a Table of Contents. I like how it's broken into chapter. I'd like to see each chapter individually, but these chapters aren't too big. If you work at this very regularly, you can finish a guide in as few as 8 weeks. It takes us a bit longer since I want Mr. B to read it all on his own, so its more like 12-14 weeks for us. And that's reading daily, and working on the guide about 3 days a week. I don't force it, and sometimes allow him to answer just a couple of questions if he's had a good discussion about it. I appreciate the added Synopsis. As you can see from this, this book is a Tween'ish version of a dystopian novel/science fiction/Fantasy style book. I have really found it quite interesting, as an adult, reading ahead. I always like to read ahead in case he has questions or anything like that, and to make sure it is appropriate for him. Here are a few pages to show you the full page, as it is with no work on it yet. There's a lot of added bonuses and optional activities. I like that you are given the chance to really dive in and study more, if you're interested in doing more. These have given us some really good ideas I may not have thought of on my own. Here are some screen snips of what it looks like as you have answered. Overall, I think you just can't go wrong with Progeny Press. They're our go to for Literature Guides! I love the interactive style, and Mr. B can easily type into the PDF, then I can print for our records. There's a wide variety of books to choose from, giving you all sorts of options. We highly recommend this! See what others had to say! Check out the Homeschool Review Crew today!